By popular vote, the greatest batsman in the world today, Sachin Tendulkar has the cricketing world at his feet. The adulation he commands world over is unsurpassed, perhaps since the days of Don Bradman, to whom of course he has been compared, by no less than the great man himself. While he may not end with a Test career average of 99.94, there is little doubt that based on his vigorous style of batsmanship and his insatiable appetite for runs and big scores, he is the most complete batsman since Vivian Richards. In many ways though he has surpassed even that outstanding West Indian batsman. Tormented once, as Shane Warne says, by master-blaster Sachin Tendulkar in nightmares, the legendary leg-spinner has finally found words to express his admiration for the batsman. A candid and insightful autobiography by Warne, which hit the stands in Sydney, describes how he was "Tendul-corized" and hails the Indian as "number one" in the game. Amongst descriptions of the many memorable matches played against almost all cricketing nations across the globe, Warne relates the legendary on-field battles with Tendulkar and Brian Lara. "Much has been made of my personal contest with Tendulkar," he writes. "Some people have said that my duel with Tendulkar in India in 1997-98 was the most compelling Test cricket they have ever seen, but there is no doubt he enjoyed the better of the exchanges. "He has played me better than anybody. Most Indian batsmen pick the length very quickly, even when it is flighted above the eyeline, but Tendulkar moved into position even earlier than the likes of Mohammad Azharuddin and Rahul Dravid." The eulogy continues. "His footwork is immaculate. He would either go right forward or all the way back and he has the confidence to go for his strokes. I suppose I would be confident too if I batted as well as Tendulkar." The candid admissions seem to flow right from his heart as he says, "Although my statistics in that series don't make happy reading, I am still prepared to say it was a pleasure to bowl to him". Warne even goes on to write: "Obviously, I never bowled to the Don, but if he was consistently superior to Tendulkar then I am glad he was an Australian." On the loss in the Coca Cola Cup final in Sharjah, Warne says, "We were once again Tendul-corized!" He also talks of how ahead of the 1997-98 series against India while he was recuperating in Australia, Sachin was practising intensively by deliberately scuffing up an area outside leg stump in the nets to face the Aussie wrist spinners. "I suppose I should take it as a compliment that he felt he needed to do that before he took Australia and me on. I have nothing but admiration for the guy and as the series progressed he showed why he is the number one." The other Indian batsman who impressed Warne during the series was the opener Navjot Singh Sidhu. "One batsman I never felt received the credit he deserved during the series was Navjot Sidhu," he writes. Among the spinners during 1990s who gave Warne most pleasure were Anil Kumble and Mushtaq Ahmed. Warne writes, "If he was not a hero in India already then Kumble set himself up for life when he took all 10 Pakistan wickets in an innings in Delhi in February 1999." Kumble was always like an old buddy for Warne. "We would chat about our methods. It is no different from a couple of used-car salesmen bumping into each other. They will pass on a few tricks about deceiving customers while we talk about deceiving batsmen. "Kumble's strengths are his longevity and consistency.... He is a thorough gentleman off the field but extremely competitive on the field." Warne talks at length about the match-fixing controversy while pleading his innocence. "I have never attempted to fix a game or any part of a game in my life. I never would and never will. Nor have I knowingly received money from a bookmaker. "As far as the man I knew only as John is concerned, I was stupid and naive to accept money. It didn't dawn on me that he might be involved with trying to fix cricket matches. I thought he was a wealthy man who liked to bet, who had won money on Australia in the past and wanted to express his thanks. I took it at face value and thought he was telling the truth." "In hindsight I think it would have been better for all of us if the Board had made it public straight away." The news that Mark Waugh and Shane Warne had taken money from a bookie broke after months of silence from the ACB in December 1998. "In my heart I knew I had done nothing wrong. I would love John to come forward to confirm my version of the story. In future, if I can still help the cricket authorities to get to the bottom of anything relating to corruption then I will be happy to assist," he writes. He further writes: "Like Hansie Cronje, Mohammad Azharuddin was another guy I never held under any suspicion, but who is said to have been involved. I thought of him as a very polite, sensitive, quiet person, who dressed extremely smartly away from the game. "He was also a particularly high class batsman, capable of taking batting to another level on his day." Even while discussing Sharjah and charges of it being the hotbed of corruption, Warne cannot help but allude to Tendulkar, albeit in a humurous vein. "I have played in Sharjah, where investigations have centred, and not to my knowledge, set eyes upon a bookmaker. "I am afraid, like Sachin's straight drives, it all went over my head!" In Warne's opinion, match-fixing warrants a life ban and it is the duty of every cricketer to pass on any information however small and insignificant it might seem to the authorities. But his own gambling habits are no hidden secrets. "I played blackjack and roulette and bet on Aussie Rules, but never on cricket when I was involved." Warne, who made his Test debut against India in 1991-92, says, "Apart from the pitches in India, the harsh conditions, heat and humidity explain why so few sides come out on top. "But I must say that food did not present quite the problem for me that people might have imagined from some of the newspaper headlines and pictures of tinned spaghetti and baked beans being shipped out with the words 'To Shane Warne in India' plastered all over the crates." Warne is indignant about the Australian team being labelled as the worst sledgers in the world. "Fast bowlers generally sledge out of frustration. For some reason Australia have acquired the reputation of being the worst sledgers in the world, but I think New Zealand should hold that mantle. "Compared to the Australian side I joined in the early 1990s, the team of today is relatively quiet, even with McGrath in our ranks," he writes. And it was none other than Allan Border who taught Warne the usefulness of sledging. "If things were not happening for me, he (Border) suggested it was probably worth having a word with the batsman - not for the sake of having a go, but to switch myself on for the contest." While Shane Warne may not have been included in Bradman's Dream Team, he has been voted one of the five greatest cricketers of the twentieth century along with Sir Donald Bradman, Gary Sobers, Vivian Richards and Jack Hobbs. In the book, Warne lists his own Dream Team and Tendulkar, who is the only contemporary cricketer to find a place in Bradman's XI, figures in both Rest of the World Test and one-day teams. SACHIN TENDULKAR is a rarity in modern sport. He will freely talk about the great teams in which he has played and even the great players he has played against. But ask him about his extraordinary gifts at the wicket and he digs in, Boycott-fashion. It is not that he is unaware of his status on the international cricket scene, just that he genuinely has derived "the most pleasure when being a part of a winning Indian team". And beating Pakistan in the '92, '96 and '99 World Cups has given him "three great moments" in his career. He made his debut for the Indian one-day and Test team at the age of 16, he is the only player to score five Test centuries before the age of 20 and the youngest player to score 1,000, 2,000, 3,000 and 4,000 runs in both formats. Throw in, for good measure, being made the second-youngest captain in the history of Indian cricket in 1996, and at the age of 28 Tendulkar would be forgiven for feeling that there is little more left for him to achieve. His biggest daily challenge comes not in the chaotic carnival atmosphere of India's cricket grounds, but in maintaining a private life, away from the constant glare of a grateful but fanatical nation. His early interest in the game was nurtured by his elder brother, Agit, who although 10 years his senior, recognised his younger brother's precocious talent. Agit was a competent player who has, throughout Tendulkar's career, been a friend, confidant and, on occasions, assumed the role of coach. "He will still discuss the finer points of my game. There is nobody that knows more about my batting than Agit. He never speaks publicly about the help he has given me; in fact I don't think he likes talking! And he certainly doesn't like watching any match I'm playing in. "It has become quite a joke, because we can never find him when he knows I have to play a big innings. I scored a hundred in a school match and he has not been back since. Somebody rings him up after I have played to tell him what I've done and then he'll watch it on tape." His father, Ramesh, took a more paternal and laid-back approach to his youngest son's talent. "He was a writer and poet, not particularly interested in sport, but was always supportive, without putting any pressure on me. He would say: 'Whatever you do in life, be sincere and honest'. I think I have inherited my father's inner calm." It is that inner calm that provided such a vital foundation for his debut for India in 1989 against Pakistan in a one-day match at Gujranwala and later that year in a Test at Karachi, against the pace-bowling of Wasim Akram and Waqar Younis. "I remember walking into the changing room and wondering how I would cope with all the famous names around me and they were all about twice my age. My captain, Krish Srikkanth was a great supporter. He sat me down before the game and told me that I belonged in the team, and they were all very proud of my achievement. Nobody made me feel like a teenager." It soon became obvious that Tendulkar was no ordinary teenager wondering where the next beer was coming from. It was his uncompromising mental and physical approach to the game that set him apart. "I was too young at 16 to be frightened by anything. I went out to play as hard each time as I could. I dreamed of being the best player in the world, but you don't disclose that. I just wanted to score more runs than anybody else. I know now that it is mental discipline that sets people apart, the ability to think differently and to generate energy in the right direction. Everybody is trying hard; the players who succeed are the ones who push themselves a bit harder." The two players to whom he constantly refers are Sunil Gavaskar and Vivian Richards from whom, for different reasons, he has drawn strength. "Gavaskar had incredible discipline and consistency and the technique to match and Richards had such aggression. He could destroy the best bowling anywhere. I suppose I like to think I've got the qualities of both those players, but it was Richards who, I suppose, I found inspirational. 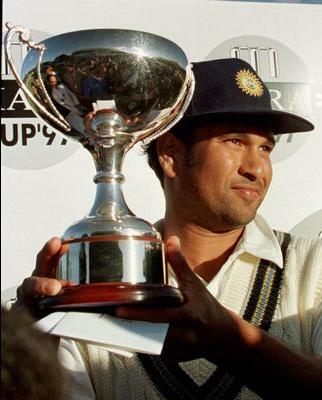 Of the current crop, Tendulkar believes Steve Waugh and Brian Lara are the best. Although he enjoys the cut and thrust of the one-day game, he recognises that the five-day distance is more challenging and "provides the real test for the batsman or the fast bowler". 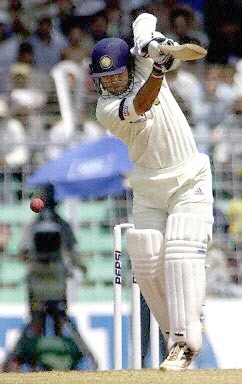 Tendulkar considers himself to be a product of the one-day game. Not for him the tortuous arguments of traditionalists versus modernists. "The one-day game has advanced, not hindered, the traditional Test series. It has made cricket far more positive. It has improved, without question, the standard of fielding. It has brought massive changes to the game, but it has made it much faster and has changed the fitness level for everybody. "I don't see a problem in picking two different types of team and if the player can't adapt he should be left out." 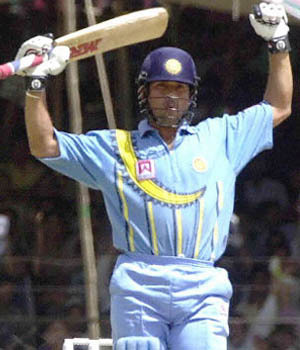 Tendulkar considers his greatest innings to have been his 141 against Australia in the Wills International Cup quarter-final in Dhaka in 1998. "Nobody expected us to win. It was the day that everything came together. I can still remember almost every stroke I played that day." His total came from 128 balls with 13 fours and three sixes. It also gained him his 30th man-of-the-match award at international level, and he followed this up with bowling figures of four for 38 off little more than nine overs. In the same year, at the age of 25, he created a world record when he scored his 18th limited-overs century, expunging Desmond Haynes from the record books. 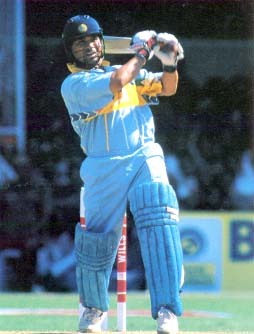 Tendulkar's talents were all too briefly on show when he played a season for Yorkshire, in 1992. "It was a tremendous experience and exposure and, in many respects, a highlight for me, particularly as I was the first overseas player to play for Yorkshire," he said, although Sir Len Hutton was probably turning in his grave. "I'm sorry I couldn't stay longer, but there was just no way I could combine five months' commitment to the Indian team with a county season. I don't think it will be possible for me to play for a county." He is keen to go on chasing records and, in the process, ripping the heart out of the world's best bowlers. He has established unquestionable supremacy over them all, including Australia's Shane Warne, who he places among a handful of great bowlers against whom he has played, including Sir Richard Hadley, Malcolm Marshall, Curtly Ambrose and Courtney Walsh, although he is unwilling to rank them. The disfiguring episode of match-fixing, which has engulfed the game in so many countries, was "a cause of great sadness". Like many, he was surprised by the depth of the problem. "I didn't expect to read those kind of things in a paper. Luckily, it didn't affect the morale of the team and I think we all felt our great challenge was to start a new chapter. We were also lucky that our team was a young team and the Indian public did really get behind us. "I think a lot of cricket fans felt badly let down and disappointed. Although I think the game is far too big to be damaged long-term, it was just a horrible phase and I think it was important to change direction, although obviously it was very painful." There is little hinterland in Tendulkar's life. Cricket is all-consuming and, apart from a devotion to his family, everything else is on hold until he retires. "I want to stay as fit as I can for as long as possible and focus all my energy on scoring runs. I don't like living in the past or the future and I certainly can't think five years ahead," he said. Only at the end of his career will he make any real attempt to develop his commercial potential which, given his profile in India, is immense. With age on his side, many who know about these things, including Ian Botham who believes he could go on to be the "finest of all time", say his best years may still be ahead of him. It will be some time before he feels it is right to develop his interests away from cricket. "I would like to be remembered as somebody who tried hard for my country - very hard." Chennai was as hot as you like. Hot enough, anyway, to have the members of the national cricket team, getting back together after a break of over a month, sweating. While the remaining members of the team -- and backup bowlers like Harbhajan Singh and Ashish Nehra -- went through their paces, Sachin Tendulkar, re-appointed captain of the Indian team, was elswhere, getting his back seen to. Sachin, it's been some time now since you've been re-appointed captain of India -- are you getting used to the idea of being captain again? It's been over 20 days now, I am getting used to the idea, I am quite happy about it... very excited, and looking forward to the new series. Not exactly. The statement I made was that I was expecting 100 per cent effort. Effort has to be there. If you can't put in 100 per cent effort, then what's the point in playing? There are ups and downs, sometimes you may perform well, sometimes you may not, but the effort, putting the effort into it all the time, that is very important. And that is what I am looking for. Sure, because when you play for India you have to be committed. There are times when lethargy sets in, and that is the time to pull up your socks. Somehow, for the lay viewer, when you play for India the commitment is always taken for granted. Isn't that how it always is? Yeah, that is what everybody expects of you, but there are times when you are mentally low, physically not as active, and that is the time to push as hard as possible, and that is what I want from the players. That is very important, because X player might work abroad, but might not do as well in India, whatever, you know... Some players might be very good in India but might not be good abroad. So you have to... I think analysing the player is more important than just looking at the performance. So are we going to see a different approach to the captaincy? I'll stick to the same things, because the last time when I was captain, I tried my level best to win all the games for India, and now once again I am captain, and I want to win most of the games for India, and that is what I must try and do. As captain, I have always thought in terms of the interest of the team, so there is no need to change that now. I am not going to say that Azhar didn't do it, but each different person has a different style of approach, so my style is probably different from Azhar's, I would certainly like to go up to the player and tell him this is what I expect from you, this is your responsibility. Each and every individual, his performance level is going to be different from that of the others, so you have to expect from each player what he can give. Well, that is very important, we have to be very consistent, and most importantly start winning abroad. So how do we go about doing that? When you look at it on paper, we are a very good team, so what is it that is causing this inconsistency? I can only work that out on the field, I can't answer it here in theory. I was actually asked a question, I had to answer that question and what I said was that it was actually not a bad idea. I am not saying it is going to work out, or it is not going to work out, unless we try it out it would be very hard for me to comment about it. I think there are many more people who are capable of taking these decisions, so for now I guess I'll leave it to them. I feel we have to start playing on good, true tracks... domestic cricket is what I am talking about. And that is how the standard of playing is going to improve, so we have to start concentrating more on the domestic circuit. Well, I look forward to that. Whatever has happened in the past, I like to leave it behind. There were plus points and minus points, this is a new tenure and I look forward to that. You've already established yourself in a way by asking for two additional players in the camp -- you asked for a left armer and an off spinner, what were the reasons behind that? I feel they are promising youngsters, and I think it is time to encourage many more youngsters in India. This time it is Harbajan (Singh) and (Ashish) Nehra, I'd like to look at many more youngsters, get to know what they are. Yeah, this is one way of having a close look at some of these youngsters, so... Nehra bowling to Saurav, Rahul, it's a different story altogether, the youngster gets that exposure and also, he carries that confidence when he goes back to domestic cricket. Are you disappointed at press reports that talk about your "friend" being selected for the Indian team? I am very disappointed, because it is very hard to accept that people in India think like this. My mind doesn't work that way, I am captain of India and not of Shardashram, so I have a very broad mind, I have to see who is good for India and it is in the interest of India that I am taking all the decisions. Last time when I was captain the last time in Sri Lanka, Vinod Kambli didn't play a single game and nobody commented about that. So friendship is all off the field, not on the field. I made a statement saying that I want 100 per cent effort from the players. There are going to be ups and downs, nobody is a machine which scores 100 runs every day or takes five wickets every day. I am not so worried about the performance, I only want 100 per cent from the players, total dedication and application, it's just a matter of six hours, and I am sure we will start doing better. Back to sub-continental conditions after playing in England, back to trying to get 85, 90 in the first 15 overs? No, we've just got to see what happens there actually, we have not played in Galle, we have not seen the wickets and the ground, so we can't have ideas sitting here in Madras, sitting here you can't think of what you are going to do out there, but you can certainly plan what you are going to do at the Khettarama Stadium and the SSC. It's interesting because we thought you might need the extra spin bowler, but you've picked the additional seam bowler.. It rains in Sri Lanka, so when the game is shortened, a medium pacer comes in handy. "I saw him playing on television and was struck by his technique, so I asked my wife to come look at him. Now I never saw myself play, but I feel that this player is playing much the same as I used to play, and she looked at him on Television and said yes, there is a similarity between the two... high compactness, technique, stroke production... it all seemed to gel!" Sachin Tendulkar will easily break all international batting records. "He has everything a top batsman needs. Tendulkar is a classic example of a player being so good that his age is an irrelevance".
" You take Don Bradman away and he is next up I reckon. " " We were defeated by a better player. " -Steve Waugh, Australian skipper, after Australian team lost the final of Coca Cola Cup in Sharjah. "I'll be going to bed having nightmares of Sachin just running down the wicket and belting me back over the head for six. He was unstoppable. I don't think anyone , apart from Don Bradman , is in the same class as Sachin Tendulkar. He is just an amazing player." -Shane Warne, after Australia's tour of India and Coca-Cola Cup in Sharjah. "Techincally he stands out as the best because of his ability to increase the pace at will". "A complete batsman- he's the best in the business." "Playing in the same team as Sachin is a huge honour. His balance of mind, shrewd judgement, modesty and, above all, his technical brilliance make him my all-time hero." "He moves the bat like a toothpick. You don't know where to bowl to him." -Bret Lee, arguably the fastest bowler in the world. "In the years ahead, when those who were at Lord's recollect the events of Saturday (18th July,1998), they will not think of Diana......or WG Grace. The contest staged as a tribute to both developed from lethargic beginnings into a celebration of gifts of ONE MAN. It became as much an exhibition as the collection of paintings in the Lord's museum commemorating the Doctor (WG Grace) 150th birthday. "We all heard reports after the recent Test series between India and Australia that the batting of Sachin Tendulkar had reached a new plane, that he was unquestionably the best batsman in world cricket. Well, the little master used the stage ..... to confirm that those reports are true." "Will they be staging a match on April 24, 2123, to celebrate the 150th Birth anniversary of SR Tendulkar? It seemed a reasonable question to ask at Lord's last night after the brilliant young Indian, who may lay claim to be the WG Grace of his day, had played a game quite different from that of the world's next best cricketers ..."
"I do not think even WG Grace would have played like Sachin"
"Today, he showed the world why he is considered the best batsman around. Some of the shots he played were simply amazing. Earlier, opposing teams used to feel that Sachin's dismissal meant they could win the game. Today, I feel that the Indian players, too, feel this way." "First and foremost, Tendulkar is an entertainer and that for me is as important as any fact or figure. Too often boring players have been pushed forward as great by figures alone. For sheer entertainment he will keep cricket alive." "Neil Harvey, Sunny, all had the footwork and the judgement. With Sachin his stroke off the backfoot, particularly off the pace bowler, is extraordinary-- the next thing you know is that someone is picking the ball up from the gutter." "He is a genius. He has a shot for every ball. The only way to stop him is to keep him off strike." "Everytime I see him he gets better, his concentration reminds me of Sunny"
"For Sachin the balance is there. He is quick to complete his shot. He covers the crease much better than mere mortals. " "I just get the feeling because of his mental strength that Sachin will be definitely the best player of his era and probably the best 2-3 of all time." "Whenever I see Sachin play I am reminded of the Greame Pollock quote of Cricket being a 'see the ball, hit the ball game.' He hits the ball if the it's there to be hit. " "When I'm in the middle, the only thing that comes to mind is that I'm a batsman and the team expects something from me and I should be able to live up to my teammates' expectations." "He is someone sent from up there to play cricket and go back." "We are proud to possess him due to his commitment to Mumbai and Indian cricket." "I was very impressed the first time I saw him bat as a little boy at the Cricket Club of India." "Even as a teenager he always seemed very focused and alert on the field. He learnt his lessons fast." Ans. Performers on the world scene do pep me up to a great extent. I am inspired by an innings played in search of victory. Sometimes I feel I should do better than that. I should be able to perform better than somebody else. After all, I, or for that matter everybody, wants to win each and every game. And to win what one requires is to be better than the opposition.....take one wicket more, or score one more run than the opposition. It's as simple as this. Comment. Well, you seem so much inspired by Shane Warne that you bowled leg-spinnersin the one-dayer against Australia at Kochi and even claimed 5 wickets. Ans. I was initially bowling off-spin in that game. At some time I thought of trying leg-spin against Steve Waugh, hoping to make him play against the spin and trap him. The very first leggie that I bowled he was caught and bowled! Then I decided to bowl leg-spinners to the right-handers and off-spinners to the left-handers. My move paid off. I agree, it was a gamble. But then, not being a regular bowler, I had to experiment.After all, my job is to take the odd wicket or bowl a crucial over or try and bring about a change in the situation. My captain expects this from me. Qs. Many a time you seem to be sticking out your neck and taking risky decisions. For instance, on the New Zealand tour, a few years ago, you decided to open the innings and opted to bowl the last over of the Hero Cup against South Africa. Well, you succeded most of the time, but aren't you worried about failure and criticism? Ans. When I decided to open the innings in one-dayers I was very confident of success. So I conveyed my feelings to Azharuddin and Ajit Wadekar. I was also very confident of bowling the last over against South Africa and winning the game for India. I think, I have the required confidence in my ability and the will to perform. Why should I give it up? Why shouldn't I try? Why should I leave a single stone unturned in the quest for victory? Fortunately, till now the moves have paid off ! Qs. What do you think about cricket rankings? There's just less than 10 points' difference between you and Jayasuriya in the CEAT ratings. In such a situation, the rules say, the panel will decide who is no. 1. Does this number business really matter to you? Ans. I am not really worried about being No.1 or No.2 as long as I am considered among the top few batsmen. To tell you the truth, I have always dreamed about being in the top brass of batsmen. The real value of a batsman is determined when the opposition thinks his wicket is important.......when the opposition sweats that much extra for his wicket. I want the opposition to always be on its toes when they bowl or bat against me. I think, maintaining this reputation gives me enough drive to succeed. Comment. But, sometimes you seem to be getting out to deliveries that don't deserve your wicket. Ans. Probably, because of the kind of shots I play. There is a fair bit of risk involved in my style. It is possible that I might have got out playing the same kind of shot twice, but 8 out of 10 times I have got runs on the same shot. That could be a scoring shot. I am trying to improve. You see, I want India to win more often. For this it is necessary that I get runs and get them quickly. Basically, I am an aggressive batsman. You will never see a defensive batsman getting out hooking or pulling. What is wrong is to play a bad or an ambitious shot and get out. Remember, there is a very thin line between an aggressive shot and a bad or ambitious shot. Comment. A double century eludes you in tests. Qs. Do you set goals for yourself? Ans. I do, but it's series by series. Qs. What goals did you set when the Australians last toured India? Ans. I wanted to score a couple of convincing and match-winning centuries.